National Semiconductor has been producing and designing ICs for use in switch-mode power supplies for many years. The application of these devices is normally straightforward, helped by the excellent documentation that is available. 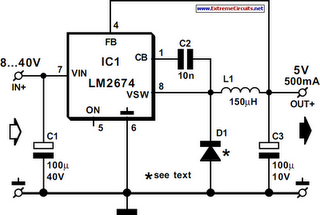 A typical example of a switch-mode power supply is that based on the LM2671 or LM2674. The components for it are available for outputs of 3.3 V, 5 V and 12 V. There is also a version providing a presettable output voltage. Within the specified application, the supplies can deliver currents of up to 500 mA. Note-worthy is the high switching frequency of 260 kHz. This has the advantage that only low-value inductor and capacitors are needed, and this results in excellent efficiency and small dimensions. In normal circumstances, the efficiency is 90% and may even go up to 96%. Both ICs provide protection against current and temperature overloads. The LM2671 has a number of additional facilities such as soft start and the option to work with an external clock. The latter enables several supplies to be synchronized so as to give better control of any EMC (ElectroMagnetic Compatibility). The application shown in the diagram provides an output voltage of 5 V and an output current of up to 500 mA. Diode D1 is a Schottky type (Uco≥ 45 V and Imax≥ 3 A).